Standard - Reconstitute the Standard with 1.0 mL of Standard Diluent, kept for 10 minutes at room temperature, shake gently(not to foam). The concentration of the standard in the stock solution is 4,000pg/mL. 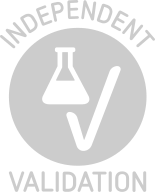 Please firstly dilute the stock solution to 1,000pg/mL and the diluted standard serves as the highest standard (1,000pg/mL). Then prepare 7 tubes containing 0.5mL Standard Diluent and use the diluted standard to produce a double dilution series. Mix each tube thoroughly before the next transfer. Set up 7 points of diluted standard such as 1,000pg/mL, 500pg/mL, 250pg/mL, 125pg/mL, 62.5pg/mL, 31.2pg/mL, 15.6pg/mL, and the last EP tubes with Standard Diluent is the blank as 0pg/mL. 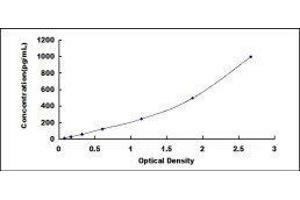 Average the duplicate readings for each standard, control, and samples and subtract the average zero standard optical density. Construct a standard curve by plotting the mean O.D. and concentration for each standard and draw a best fit curve through the points on the graph or create a standard curve on log-log graph paper with IL24 concentration on the y-axis and absorbance on the x-axis. Using some plot software, for instance, curve expert 1.30, is also recommended. If samples have been diluted, the concentration read from the standard curve must be multiplied by the dilution factor. Product cited in: Chen, Zhou, Xiao, Huang, Zhang, Gu, Tang: "Inhibition of ALDH2 protects PC12 cells against formaldehyde-induced cytotoxicity: involving the protection of hydrogen sulphide." in: Clinical and experimental pharmacology & physiology, Vol. 44, Issue 5, pp. 595-601, 2017 (PubMed). Zhu, Wei, Zhang, Chen, Qin: "Oncolytic adenovirus armed with IL-24 inhibits the growth of breast cancer in vitro and in vivo." in: Journal of experimental & clinical cancer research : CR, Vol. 31, pp. 51, 2012 (PubMed). Jensh, Veloski: "Program for increasing use of computers in medical education." in: Journal of medical education, Vol. 61, Issue 2, pp. 137-9, 1986 (PubMed).